This piece is pastel on paper. I found working in pastel on such a tiny figure a bit tricky. It makes me have new respect for the artists who can make pastel look like paint, namely, the intrepid Rosalba Carriera and Mary Cassatt. I'll probably try this again as a big sky painting. I love it! How imaginative! Great picture! What an idea! I love the way the red dress stands out. What a happy image! This brought a big smile to my face. Thanks for sharing. Totally cool illustration! 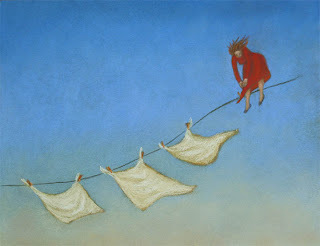 I love images of hung laundry... You captured it well. I just did a similar image for a poster I designed this week, but not nearly as nice as your's, okay it's nothing like your's, but it did involved a clothesline, love the pastels. I love it! I just want to grab a hold and sail right along side her! Beautiful imagery! Brilliant--a powerful and super affirming image!